The recent case of African swine fever (ASF) in China is a stark reminder of the negative impact that a trade limiting foreign animal disease can have on pork producers. The outbreak in China has resulted in the implementation of quarantines, movement controls and mandatory culling of swine in affected areas in an effort to control the disease. Studies led by Dr. Dermot Hayes, economist at Iowa State University, at the Center for Agricultural and Rural Development Food and Agricultural Policy Research Institute (CARD FAPRI) have estimated that in the first year of an ASF outbreak in the United States revenue loss by commodity would be $8 billion for pork, $4 billion for corn and $1.5 billion for soybeans. Keeping trade limiting foreign animal diseases (FADs) like ASF out of the U.S. is critical to pork producers along with taking steps necessary to elevate the level of FAD preparedness in the industry. The Pork Checkoff has multiple educational resources available to pork producers to help address these topics. International travel and hosting of international visitors can pose a risk for the introduction of a FAD into the U.S. It is important for pork producers to understand the risks and ways to reduce risk to help protect the industry. There are steps that pork producers can take to raise the level of foreign animal disease preparedness across the industry and that information can be found on the Checkoff’s FAD Preparation Checklist. 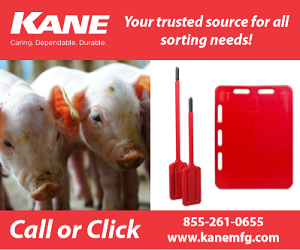 Early detection of trade limiting FADs of swine provides the best opportunity to contain an outbreak. Pork producers and their employees are the frontlines of defense. The posters in the FAD push packs provide barn level awareness that serve as a daily reminder of the importance of FAD awareness. The Center for Food Security & Public Health provides education specific to ASF that can be used for group training.